Scour the skies above planet Umbara in the versatile Z-95 Headhunter! As featured in the Star Wars: The Clone Wars animated TV series, this multi-purpose starfighter is the perfect weapon against the evil Separatist forces! Retract the landing gear and fire the LEGO Technic shooter! Store the electrobinoculars and blaster in the rear compartment weapon rack! 3 minifigures with assorted weapons and an accessory: Clone Pilot, a 501st Clone Trooper and Pong Krell…. Scour the skies in the versatile LEGO Star Wars Z-95 Headhunter! As featured in the Star Wars: The Clone Wars animated TV series, this multi purpose starfighter is the perfect weapon against the evil Separatist forces. It makes a great addition to any LEGO Star Wars collection and it’s perfect for imaginative play. LEGO model number: 75004: Retract the landing gear and fire the shooter. Store the electrobinoculars and blaster in the rear compartment weapon rack! Includes 3 LEGO minifigures with assorted weapons and an accessory: a Clone Pilot, a 501st Clone Trooper and Pong Krell. For ages 8 years and over; EAN: 5702014974883. WARNING(S): Not suitable for children under 3 years old. Scour the skies above planet Umbara in the versatile Z-95 Head hunter. As featured in the Star Wars: The Clone Wars animated TV series, this multi-purpose star fighter is the perfect weapon against the evil Separatist forces. Retract the landing gear and fire the LEGO Technic shooter. Store the electro binoculars and blaster in the weapon rack. This LEGO set Includes 3 minifigures with assorted weapons and an accessory: Clone Pilot, a 501st Clone Trooper and Pong Krell. 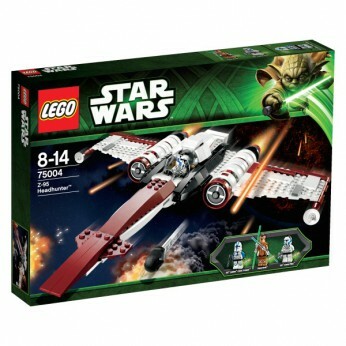 This toy costs approximately £29.99 (for the latest and best prices make sure you check our retailer list for the LEGO Star Wars Z-95 Headhunter 75004 above). In our review of LEGO Star Wars Z-95 Headhunter 75004 we classed it as being suitable for ages 6 years, 7 years, 8 years but recommend you check the manufacturer specific advice before purchasing.